In studies with lab-grown human cells and in mice, Johns Hopkins Medicine researchers have found that an experimental drug may be twice as good at fighting vision loss as previously thought. Aleksander Popel, Ph.D., Professor of Biomedical Engineering at the Johns Hopkins University School of Medicine. The study was published in the Feb. 21 issue of the Journal of Clinical Investigation Insight. In healthy eyes, the cells that make up blood vessels are bound together by proteins residing on the surface of the cell that are directed into place by Tie 2, another protein. Tie2 proteins pack tightly together where cells meet their neighbors and act like Velcro to create a fluid-tight connection between cells in the blood vessel’s wall. 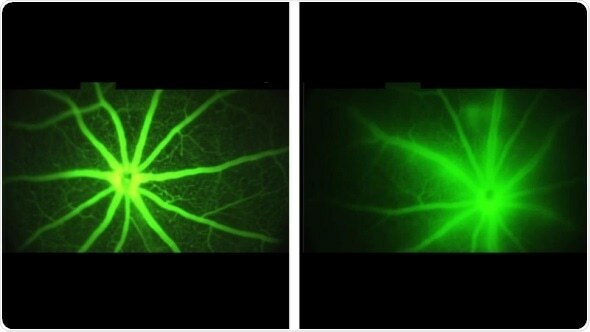 In diabetic macular edema, the Tie2 proteins disperse across the cell and no longer can maintain the fluid-tight barrier between the inside of a blood vessel and the outside. Gaps form between the cells, allowing fluids to permeate into the surrounding tissue. In their first experiment, the researchers used cells derived from human blood vessels grown in the lab that mimicked those seen in wet age-related macular degeneration. When they added the AXT107 drug to these cells, the researchers found that AXT107 initiated a series of changes to cellular proteins. Using a technique to measure protein changes, the researchers found that Tie2 proteins seemed to migrate across the cell. Groups of Tie2 proteins began to congregate where cells met their neighbors, and began rebuilding connections with other blood vessel cells. The researchers further tested whether these smooth cells could create a watertight barrier, which would be necessary to create a blood vessel that doesn’t leak. So they grew the cells in a single layer and tested whether fluid could pass through by pouring a fluorescent liquid on top of the cells and checking to see if any of the glowing liquid ended up underneath. The researchers observed that cells treated with 100 µM of the AXT107 drug allowed 2.5 times less dye through the cell layer than control cells receiving no drug. This showed the researchers that the drug helped blood vessel cells create a watertight seal between them. The researchers treated the engineered mice with leaky blood vessels, like those seen in macular degeneration, with injections of the AXT107 peptide into the animals’ eyes. After four days, the researchers found that in mice treated with AXT107, about half as much of the fluorescent dye leaked from their vessels as in animals that received saline injections containing no drug. These results, say researchers, show that the AXT107 drug was able to seal up leaking vessels and prevent vision-blocking fluids from permeating into the surrounding tissue. Popel says AXT107 provides a new therapeutic approach that targets two clinically validated pathways for retina diseases while the anti-VEGF agents only target one aspect of the disease.